The manuscript was published March 7 in PNAS, “Glucosylceramide synthase inhibition alleviates aberrations in synucleinopathy models” (see here). Scientists at Sanofi/Genzyme performed elegant experiments in two different mouse models to support substrate reduction therapy in the treatment of Parkinson’s disease (PD). Before I summarize the key findings, let me provide some background. There is a clear link between mutations in glucocerebrosidase (encoded by the GBA gene) and increased risk of PD (here, here). One mutant copy of the GBA gene is required to increase risk of PD five-fold. The same GBA mutations, when inherited in the homozygous state, lead to a lysosomal storage disease, Gaucher’s disease. Consistent with a direct genetic link between PD and Gaucher’s, there is an increased risk for PD among family members related to Gaucher’s patients. The underlying pathophysiology of Gaucher’s disease is due to accumulation of glucocerebroside in a cells across the body. The disorder is characterized by bruising, fatigue, anemia, low blood platelet count, and enlargement of the liver and spleen – primarily “peripheral” manifestations (i.e., outside of the central nervous system). There are two effective treatments for Gaucher’s disease: enzyme replacement therapy (ERT) and substrate reduction therapy (SRT). The approved therapies only treat peripheral manifestations of Gaucher’s disease, as neither therapeutic approach effectively penetrates the blood-brain-barrier to get into the central nervous system (CNS). Indeed, Gaucher’s patients treated with either ERT or SRT can go on to develop Parkinson’s disease. 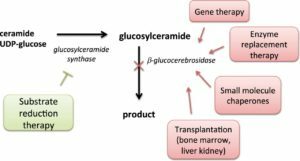 Substrate hypothesis: loss-of-function (LoF) GBA mutations lead to pathological accumulation of glycosphingolipids [glucosylceramide (GlcCer) and glucosylsphingosine (GlcSph)] in lysosomes, which interfere with normal lysosomal function (e.g., clearance of other proteins such as alpha-synuclein). Misfolding hypothesis: Either LoF or gain-of-function (GoF) GBA mutations could lead to misfolding of the GBA protein itself, irrespective of substrate build-up, which could impair lysosomal-mediated alpha-synuclein breakdown and oligomerization. Note that most believe that disease-associated GBA mutations are LoF and not GoF. Both hypotheses center on the role of the autophagy-lysosomal pathway, which plays a role in maintaining cellular homeostasis by degrading bulky cytoplasmic material, including damaged organelles and misfolded proteins (see here). However, the therapeutic implications of the two hypotheses are quite distinct. The Figure below (stolen from here) captures the essential elements of the different approaches in Gaucher’s, and by extension to PD. For the “substrate hypothesis”, therapeutic inhibition of the enzyme glucosylceramide synthase (GCS), which catalyzes the synthesis of glucocerebroside, or activation of glucocerebrosidase (GCase) itself, should be effective in treating PD by reducing the accumulation of glycosphingolipids. This is akin to substrate reduction therapy for Gaucher’s disease, as in the Figure above. This hypothesis has been partially tested with miglustat, albeit with mixed results to date (see here). From a genetics perspective, haploinsufficiency of GBA due to complete absence of one of the two copies of GBA supports the substrate hypothesis, as there is no abnormal GBA protein to misfold. The PNAS study by Sardi et al provides support for the “substrate hypothesis”, as they demonstrate that pharmacological inhibitors of GCS (see Figure 1B, pasted below) have a favorable biochemical and clinical impact in two different mouse models of PD. The study utilized two synucleinopathy murine models: (1) Gba–D409V/D409V, expressing mutant D409V glucocerebrosidase and endogenous alpha-synuclein; and (2) A53T–SNCA model, over-expressing A53T–alpha-synuclein and displaying endogenous wild-type murine glucocerebrosidase. They first showed that a brain penetrant GCS inhibitor, GZ667161, reduces CNS glycosphingolipids relative to untreated mutant mice, although not to the level observed in wild type mice (see Figure 1; also pasted below). The effect was observed in mice treated early (Cohort 1, presymptomatic) and late (Cohort 2, postsymptomatic) in the disease course. 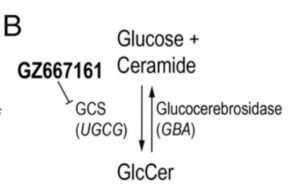 These results demonstrate the reduction of glucocerebrosidase substrate glycosphingolipids and confirm CNS target engagement of the GCS inhibitor. Next, they demonstrated that the GCS inhibitor ameliorates cognitive impairment in the same Gba–D409V/D409V mouse model (see Figure 2). I am not an expert in cognitive mouse models, so it is hard for me to assess the relevance of these findings to humans. However, they did apply two different cognitive assessments, which gives me confidence that the findings are robust. If the substrate hypothesis is correct, then one would predict that GCS inhibition would lead to clearance of alpha-synuclein aggregates. As shown in Figure 3A (and below), this is exactly what happened: GCS inhibition reduced the accumulation of pathological aggregates of alpha-synuclein. To extend their findings in a different mouse model with normal GBA activity, they utilized the A53T–SNCA model. 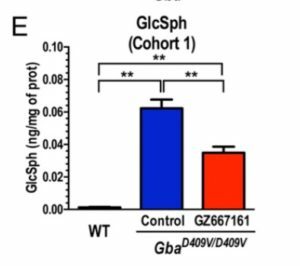 As with the Gba–D409V/D409V model, mice with the GCS inhibitor had reduced CNS glycosphingolipid accumulation (Fig. 4A); improved cognitive function (Fig. 4B-C); and reduced membrane-associated and insoluble alpha-synuclein levels (Fig. 4D) and pathological aggregation (Fig. 5). That is, the findings replicate in a separate mouse model of PD. That is, the data presented by Sardi et al supports the substrate reduction hypothesis: LoF mutations lead to pathological accumulation of glycosphingolipids in lysosomes, which leads to alpha-synuclein aggregation and PD. What is exciting is that this therapeutic hypothesis is now being tested in humans with GZ/SAR402671, a glucosylceramide synthase inhibitor (see clinicaltrials.gov link here).